National Bank of Arizona promotes its local banking expertise and award-winning services. As a full service financial institution National Bank of Arizona has a wide array of products and services to meet their customers needs. 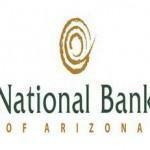 National Bank of Arizona is part of Zions Bancorporation. Zions Bancorporation is a bank holding company of regional and local banks through out the western United States. Zions Bancorp is one of the 40 largest banking companies in the United States. As such, it can blend its financial strength with the local responsiveness and personalized service. Most big banks promote a range of banking services and easy access almost anywhere in the world. Larger cities will have a lot of locations to choose from. Smaller communities and towns may not. Useful services that usually mean lots of fees to use them. In contrast, community banks have fewer locations in onw community. They promote consumer-friendly services and fewer fees. In this regard, online banking customers should pay special attention to the systems in place. Some local banks may not offer all the “on-line” capability required. ATMs and branches all over the country provide easy access. Being out of town should not cause concerns. Faster and more user-friendly online experiences. From checking account balances to depositing a check. It can be done online. Branch follow standard policies and practices. The staff may not know you, but will handle your transactions the same way every time. You are more than just a number to them so service is more personal and they value your business. Decisions are made with you and the community in mind. While they can’t avoid government regulations, they don’t have as many levels of approval big banks have. More power to negotiate when it comes to fees and loans. They won’t give the money away for free, but they value your business and are less likely to nickel and dime a person. If you are interested in a local or community bank, take the time to weigh the pros and cons. You might also want to review the option of an Internet bank while you’re at it. Other local and community banks in Tucson Arizona include – Canyon Community Bank, Bank of Tucson and Alliance Bank of Arizona. Moving to Tucson AZ or perhaps considering a future place to retire or find a winter >retreat? We can help!